The STI-091572NX MICR has an output of 50 pages per minute (ppm), and its 1200 x 1200 dots-per-inch (dpi) resolution provides crisp text and high-quality graphics. This is a low voltage model. Prints only standard MICR. Prints PCL, Postscript. The STI-091572-NM50 MICR has an output of 50 pages per minute (ppm), and its 1200 x 1200 dots-per-inch (dpi) resolution provides crisp text and high-quality graphics. This is a low voltage model. Prints standard MICR and Non-MICR applications. Prints PCL, Postscript. The STI-091572-M50NI MICR has an output of 50 pages per minute (ppm), and its 1200 x 1200 dots-per-inch (dpi) resolution provides crisp text and high-quality graphics. This is a low voltage model. Prints standard MICR and Non-MICR applications. Prints IPDS, PCL, Postscript. The STI-091572 supports up to to A4/Letter-size media at up to 50 pages per minute (ppm). The STI-091572 comes in a network model. The network model has 128 MB of memory and parallel, USB, and Ethernet ports standard. It has a standard input capacity of 600 sheets and standard output capacity is 500 sheets. It has a maximum input capacity of 4,100 sheets and a maximum output capacity of 3,000 sheets. The STI-091572 has a special network model for U.S.government bids only. A number of media options can be installed to offer additional sources of input. Combinations of the 250-sheet drawer, the 500-sheet drawer, the 2000-sheet drawer, and multiple optional drawers are supported simultaneously. The 250-sheet duplex unit offers two-sided printing for the STI-091572. An Output Expander, High Capacity Output Stacker, and StapleSmart Finisher provide flexibility and a scalable solution in the future. The STI-091572 can adapt easily to existing infrastructures with the 802.11 Wireless feature and will use the optional wireless feature to reduce installation cost by avoiding the expense of Ethernet cabling. Add this printer with a wireless card to handle peak workloads, without waiting for IT to reconfigure cables. Preserve architecture or work around areas that are difficult or impossible to cable. The STI-091572 is provided with printer management utilities. MarkVision Professional is a cross-platform print management solution that enables IT administrators to proactively monitor and manage network devices in an enterprise environment via a Web browser. The STI-091572 controller features a 514 MHz processor. It comes with PostScript 3 and PCL 6 emulation, PDF v1.5 as standard data streams and a PPDS migration tool. The STI-091572 models come with 128 MB of memory onboard and can support a maximum of 640 MB of memory. A 20+ GB hard disk with adapter feature is available. The STI-091572 printable area is limited to within 4.2 mm (0.167 in.) of top, bottom, left or right edges of the media. Any information placed outside this specified printable area will not print. ote: (1) Size 98.4x162mm to 176x250mm (3.87x6.38 in. to 6.93x9.84 in.). Transparencies specifically designed for xerographic copy machines or laser printers may be used with the STI-091572. STI-091572 is compatible with applications running under the following operating systems for either local or network connections: For information about USB connections, see Local Connections. 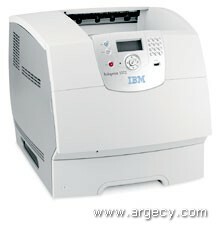 The software applications that operate with most Apple LaserWriter printers will generally operate with the STI-091572. The Macintosh 128, 512, and 512e Computers are not supported. NetPnP senses when a new IBM printer is attached to the network and automatically creates a shared printer object on the Windows NT 4.0 or Windows 2000 system. Furthermore, NetPnP notifies end-users via e-mail that the new network printer is available for printing. Designed for Windows NT 4.0 and Windows 2000 environments, Net PnP makes the STI-091572 printers available to end-users within seconds of network attachment. ote: (1) Weights for low voltage and high voltage modes are the same. This option offers two-sided printing capabilty for the STI-091572 printer. The STI-091572 has one slot for memory DIMMs and two slots for flash memory cards and application solution cards. Only one flash memory card is allowed. Supports emulation of common IPDS and SCS printers. With a card and the standard Ethernet network port or a MarkNet print server using TCP/IP, the printer becomes an host workstation printer capable of printing AFP/IPDS or SCS documents from an iSeries or System/390 computer. With the appropriate host software and one of these options, the printer emulates an IBM mainframe or iSeries host printer. See the compatibility section for details. Microcode updates and User's Guides are available from the IPS web site. When the printer is emulating an IPS printer, the function supported depends on the host software. In addition to the standard USB port and standard parallel port, each STI-091572 model has one slot for an optional hard disk, optional internal print servers, or optional local connections. The internal network adapters support and work in STI-091572 printer. STI-091572 complies with the global safety standard for Information Technology Equipment, i.e. IEC 60950, and its country equivalents in the markets we serve. The following sections highlight the approvals and certifications that STI-091572 is expected to receive. (R), (TM), * Trademark or registered trademark of International Business Machines Corporation. ** Company, product, or service name may be a trademark or service mark of others. Windows is a trademark of Microsoft Corporation. UNIX is a registered trademark in the United States and other countries licensed exclusively through X/Open Company Limited. IBM Corporation 2008.